Day 01: Arrive in Fortaleza airport – transfer to Icapui ( 200 km) in the eastern coast of the state of Ceará, where the main target will be Little-Wood Rail. The place is also good for migrant shorebirds from September to February. Day 02: Transfer to Serra de Baturité (230 Km). This mountain range lies at 800 m, c.120 km south of Fortaleza. The humid forested mountain slopes grade into deciduous forest then xeric caatinga in lower areas. Some of the key birds: Gray-breasted Parakeet, Buff-breasted Tody-Tyrant, Gray-headed Spinetail, Slender-footed Tyrannulet, Ceara Gnateater, Rufous-breasted (Ceara) Leaftosser, Lesser (Northern) Woodcreeper among others. Night in Guaramiranga. Day 03: Bird Baturite area AM. PM transfer to Quixada (110 Km). One and a half hour drive from Serra de Baturité, Quixadá is characterized by inselbergs or monolitos (strange rock formations that resemble icebergs). 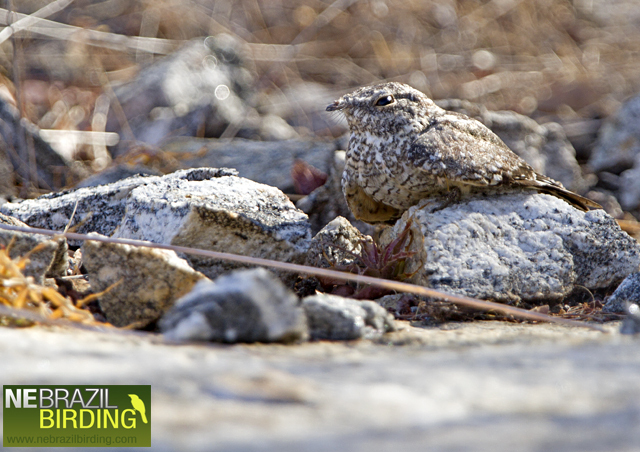 At this usually hot and dry site, the target bird is Pygmy Nightjar, which roosts and breeds among the rocks, cacti and terrestrial bromeliads. 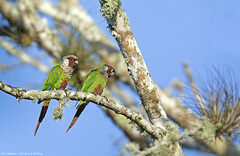 We will stay on Hotel Pedra dos Ventos, which has very good accommodation and the birds are on the hotel’s garden. 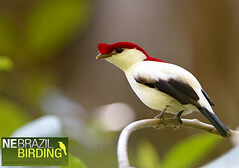 We also will start with the “Caatinga Endemics” such as Cactus Parakeet, Caatinga Cachalote, White-napped Jay, Ochre-backed Woodpecker, Ochraceus Piculet (among others) and with luck, the rare White-browed Guan. Day 04: Early morning birding Quixada and transfer to Chapada do Araripe (500 Km – long drive). This is a plateau in the south of the state of Ceará. 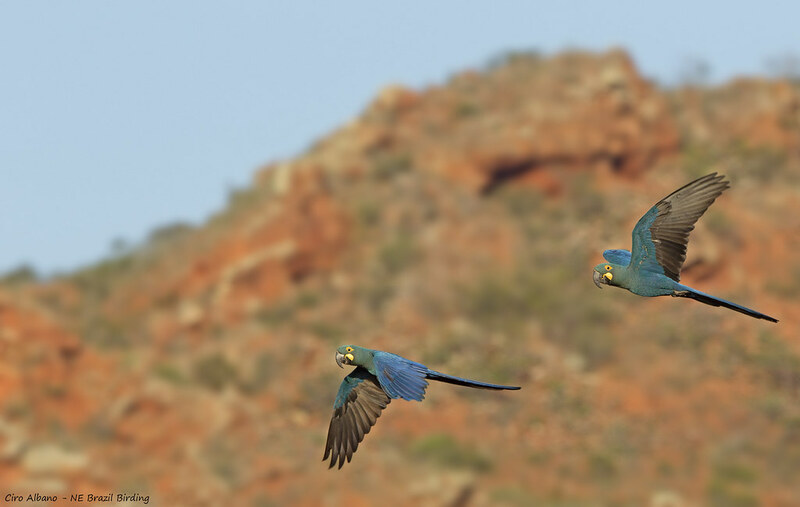 The region is rich in birds due the diversity of the habitats, the vegetation in the top of the plateau is a mixed of moist forest near the slopes, cerrado and caatinga. There are several springs along the foothills, with moist forest that is the only habitat for the amazing Araripe Manakin. In the dry vegetation of the top of the plateau we will also find many endemics such as Great Xenops, Silvery-cheeked Antshrike, Red-shouldered Spinetail, Caatinga Antshrike, Tawny Piculet, White-browed Antpitta, Caatinga Antwren, etc. 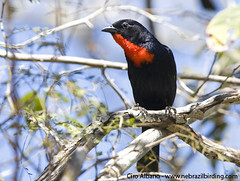 Day 05: Full day birding Chapada do Araripe. Day 06: transfer to the unique Lear’s Macaw Reserve at Canudos (360 Km) where we will stay in the very nice and rustic accommodations of the Reserve, facing Lear’s Macaw roosting area. Birding in the afternoon in Caatinga nearby the Reserve for Red-shouldered Spinetail, the local races of Lesser and Greater Wagtail-Tyrant, Least Nighthawk, Blue-crowned Parakeet, etc. Day 07: Early morning visit to Lear’s (Indigo) Macaw roosting site (always fantastic!!!). After birding, come back for breakfast in the Reserve accommodations and a long drive (496 Km) to União dos Palmares (in the state of Alagoas), our base to bird Murici Reserve next morning. Birding evening in the hotel gardens. Day 08: Cross the fingers for NO rains as the roads to the Reserve can be dangerous (muddy and slippery) if it’s wet. Leave hotel 4 AM for + – 2 hours’ drive to the forest. 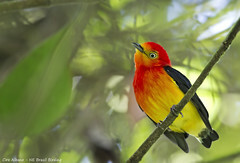 We will search for some of the rarest birds in Brazil. 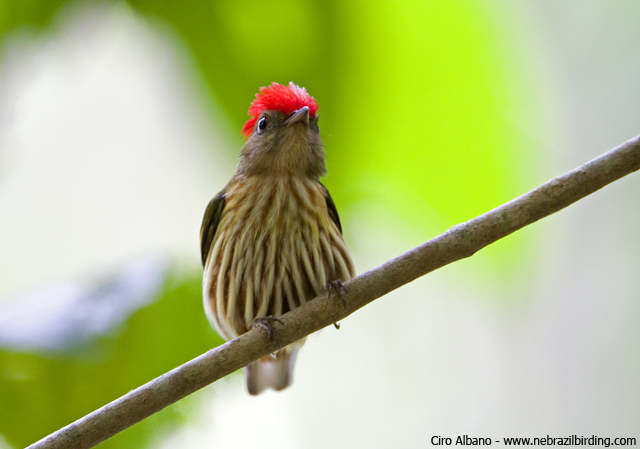 In the beginning of the 1980’s, four new species for science were described from here: Alagoas Foliage-gleaner (probably extinct), Alagoas Antwren, Alagoas Tyrannulet and Orange-bellied Antwren. 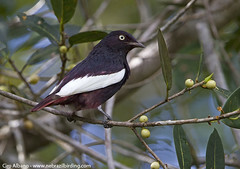 Other targets/rarities are White-collared Kite, Seven-colored Tanager, Pernambuco foliage-gleaner, Black-headed Berryeater. 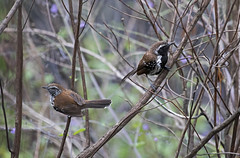 Scalloped Antbird, Golden-spangled Piculet (local race), White-shouldered Antshrike (local race), White-throated Spadebill (local race), Black-cheeked Gnateater and others. Night in União dos Palmares. Day 09: Leave hotel 4 AM to a 2 hour drive to Jaqueira (aka Frei Caneca Reserve), again let’s hope for no rain. Here we have a second chance to see the “Alagoas” specialties. This is one of the best fragments of Atlantic Forest remaining in the state of Pernambuco. It’s part of the “Serra-do-Urubu” Mountain Range. Alagoas Tyrannulet and Orange-bellied Antwren are easier to find here than in Murici. 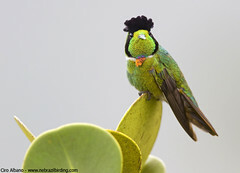 Other specialties include the incredible Seven-colored Tanager, Long-tailed Woodnymph, Willis’ Antbird and a yet undescribed species of Pygmy-tyrant (Myiornis sp. novum ). When finish we will transfer (+ – 1:30 hs drive) to Tamandare, in the coast of the state of Pernambuco, where we will spend the night. Day 10: Birding near Tamandare AM. If we still need White-collared Kite here is another good place to try. 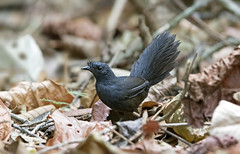 Other targets include Forbes’ Blackbird, Pinto’s Spinetail, Smoky-fronted Tody-Flycatcher. PM transfer to Estancia (500 Km – another long journey) in the state of Sergipe. Stopping on route for Pectoral Antwren in case we still need it. Day 11: Bird early morning in a forest fragment near the coast. The highlights here is the rare Fringe-backed Fire-eye. 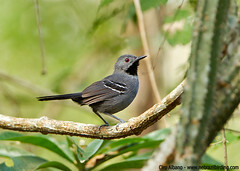 Other specialties are Sooretama-Slaty Antshrike, Stripe-necked Tody-Tyrant and again chances to find rare raptors as White-collared Kite and Rufous Crab Hawk. After birding we have a long drive to Chapada Diamantina in the state of Bahia (+ – 7 hours’ drive). Night in the nice town of Lencois. 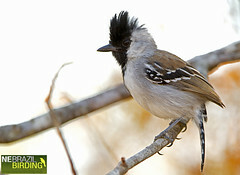 Day 12: Full day birding Chapada Diamantina. Due to altitudinal gradients, the mountains retain humid air from the sea and with rain shadows; there is a high diversity of habitats – caatinga, cerrado, campo rupestre (arid mountain shrubs), moist forest, gallery forest. 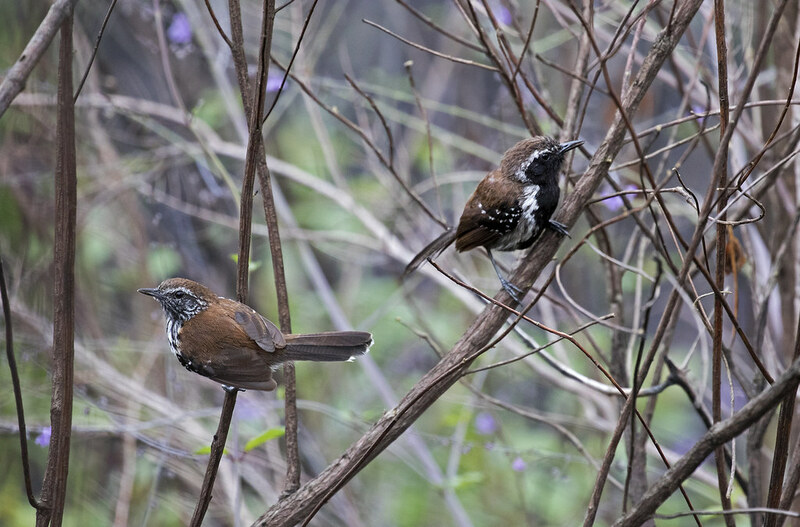 Regional endemics include Hooded Visorbearer and the recently described Sincorá Antwren and Diamantina Tapaculo. Lots of birds to see here, just to mention some other targets: Sao Francisco Sparrow, Grey-backed Tachuri, Pale-throated Serra-finch, Horned Sungem, Broad-tipped Hermit, Spotted Piculet, Rufous-sided Pygmy-Tyrant, Collared Crescentchest, White-banded Tanager are all around. Day 13: Birding Chapada Diamantina part of the morning and transfer to Barreiras in the west of Bahia (470 Km) – where we will be based to bird next morning nearby Sao Desidério – main targets will be the rare Mustached Woodcreeper, Caatinga Black-Tyrant and Wagler’s Woodcreeper (still considered as subspecies of “Scaled” by IOC ). Day 15: Bird the Terra Ronca State Park (very nice gallery and dry forest along limestone formations) in the morning for Pfrimer’s Parakeet and transfer (420 Km) to Bom Jesus da Lapa, back in Bahia, where we will look for Bahian-Nighthawk flying over Corrente river in the end of the day. Day 16: Leave Bom Jesus da Lapa early morning and drive towards Boa Nova (480 Km) stopping on route (after + – 100 Km) to bird Caetite area for Minas Gerais Tyrannulet and other Caatinga specialties in case we still need. Arrive in Boa Nova PM. 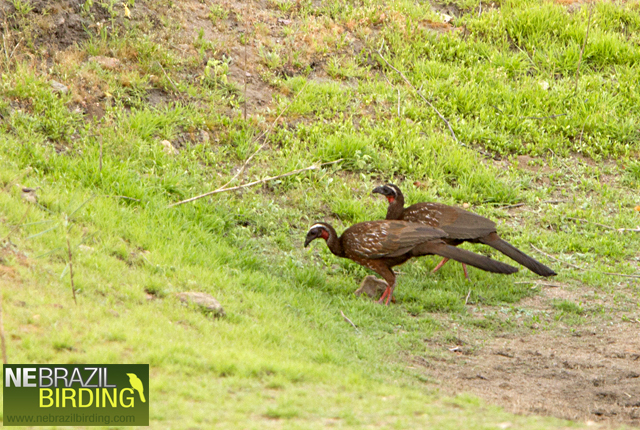 Boa Nova is located in the southwest of Bahia state where the Montane Atlantic forests meets the Caatinga. 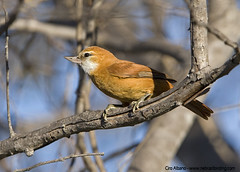 The region is home to over 400 bird species including the restricted Slender Antbird and Narrow-billed Antwren, both confined to a small area of eastern Brazil, a transitional area with dry vegetation known as “mata-de-cipo”. In less than 20 minutes of driving we leave the dry forest to a lush Atlantic forest, where we bird for species such as Striated Softtail, Bahia Spinetail, Rio de Janeiro Antbird, Fork-tailed Tody-Tyrant, White-collared Foliage-gleaner, Pin-tailed Manakin, Pallid Spinetail, Ferruginous Antbird, Gilt-edged Tanager and several more Atlantic Forest species. There’s a good site for Giant Snipe. Day 17: Full day birding Boa Nova. 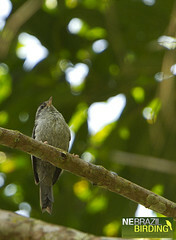 Day 18: AM Birding Boa Nova (if necessary) and transfer (290 Km) to Stresemann’s Bristlefront Reserve. This is the area where the enigmatic Stresemann’s Bristlefront was recently rediscovery. The American Bird Conservancy and its Brazilian partner Fundacao Biodiversitas have acquired almost 1,000 acres of this unique and isolated stand of Atlantic Forest to save that site, one of the greatest biodiversity hotspots in South America. Besides the mega-rare Stresemann’s Bristlefront, many others endemics occurs in the area, as Three-toed Jacamar, Maroon-faced Parakeet, Plumbeous Antvireo, Rio de Janeiro Antbird, Bahia Spinetail, etc. 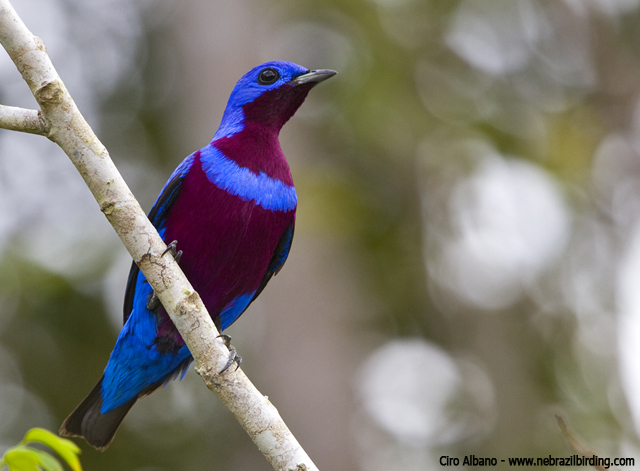 Day 20: Full day Porto Seguro; where we will be birding at Veracel Reserve (Lowland Atlantic forest). Several rarities as Hooked-billed Hermit, Red-browed Parrot, Ochre-marked Parakeet, Band-tailed Antwren, Bahia Antwren, White-winged Potoo, White-winged Cotinga and the super Banded Cotinga (very rare, here is the best place to try). Day 21: Bird Veracel AM if necessary and transfer (200 Km) to Serra Bonita Reserve (very nice jungle lodge). The Serra Bonita Reserve is a pioneering, innovative private conservation enterprise, protecting submontane forest in Southern Bahia. It aims to protect the Brazilian Atlantic Forest through a consortium of several rural property owners, whose properties contain RPPNs (private reserves). 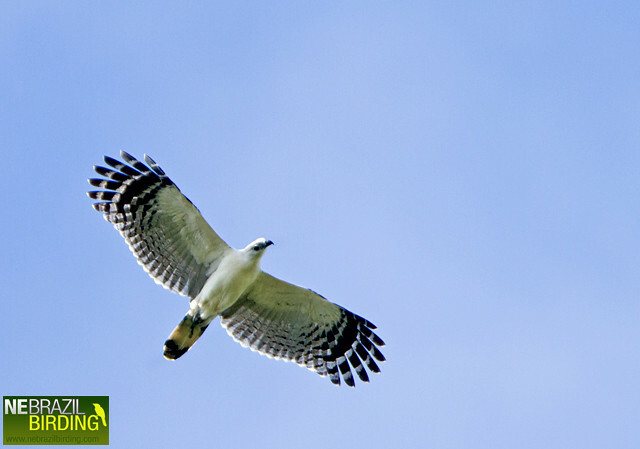 Altogether, currently they protect 2,500 ha – the second largest privately protected area of the Central Biodiversity Corridor of the Atlantic Forest. The RPPNs contained in each property are managed by Instituto Uiraçu, through agreements with the owners. In addition to managing these private reserves and its own, purchased through donations, the Institute aims to extend the protection to the entire Bonita Serra, one of the last remnants of submontane forest in the region, which covers an area of about 7,500 hectares in the municipalities of Camacan and Pau Brasil, Bahia. Some of the main targets are the unique Pink-legged Graveteiro, Bahia Tyrannulet and many more rarities as Plumbeus Antvireo, Salvatori’s Antwren; the rare Atlantic race (to be split) of Rufous-brown Solitaire, Atlantic Birds as the beauty Blue Manakin, Eastern-striped Manakin, Spot-backed Antshrike, Spot-billed Toucanet, Sombre Hummingbird, etc. 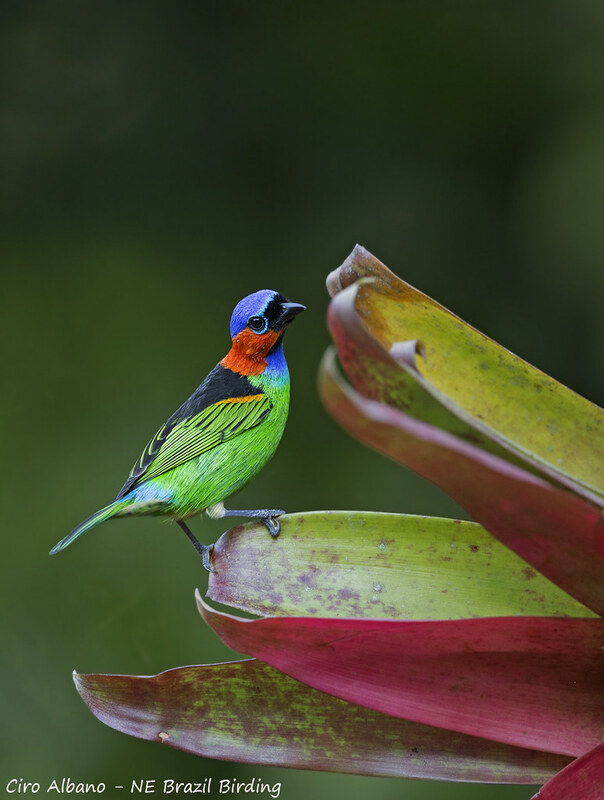 They have feeders for hummers and Tanagers (Red-necked, Green Headed, Golden-chevroned, Azure-shouldered Tanagers are some frequent visitors). 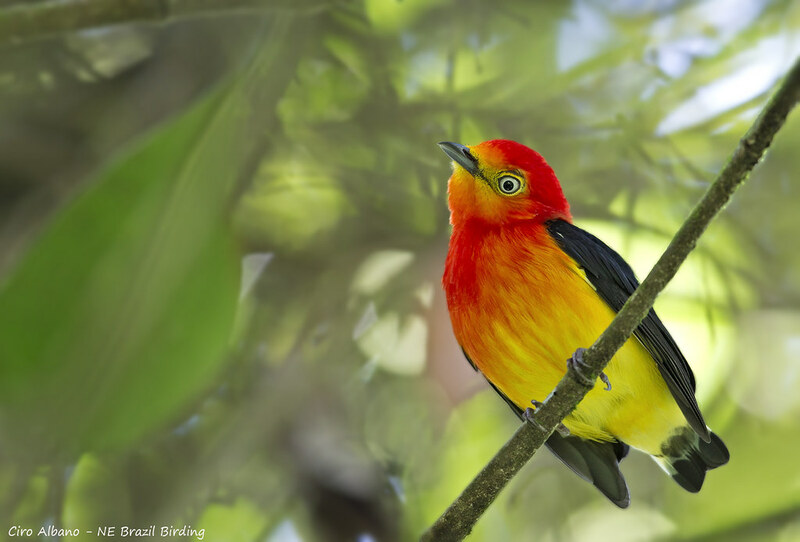 Day 22: Full day birding Serra Bonita Reserve. Day 23: Transfer to Itacare (200 Km), a tourist town in the coast. Our main target will be another very rare bird: the Critically Endangered Bahia Tapaculo. 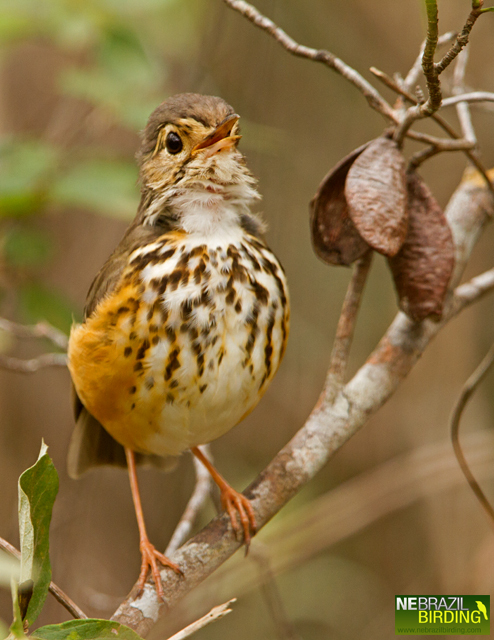 New chances for lowland Atlantic Forest species in case we have missed some. Day 24: transfer to Salvador (400 Km) (International Airport) or Ilheus (90 Km) airport from where you can fly to the main Brazilian airports.